This is two coats of ORLY’s Bus Stop Crimson (I think of Marilyn Monroe in the movie Bus Stop whenever I pick up this shade). Deep Oxblood / Red Creme. It’s official! I have found the most perfect red polish EVER! This is truly one of the prettiest shades I have ever owned (and, for some reason, makes me think of Thanksgiving). Bus Stop Crimson leans more towards the oxblood / cranberry family, as opposed to the bright red family, so it is perfect for fall / the holidays. I had some trouble with this polish. The first coat was incredibly thin and runny and got everywhere. Plus, it smelled really strongly of cranberry juice – no clue why; maybe this was just a faulty bottle. After shaking the bottle vigorously for a few minutes, I applied the second coat, and it was fine. So, I’d recommend shaking this one up a bit before applying. Regardless, this is my new favorite red – love it! Accessories: Pearlescent Love Ring Set in Silver / Clear via Forever 21. So pretty! So Marylin Monroe too! Love it with the white sweater. Such a great color for the holidays. This definitely seems the color we are searching for. Great post! Pretty! Such a new classic. I like that its not the usual red, too. I am definitely look into this color for the holidays coming up. Love the post. This is beautiful! I have a hard time picking out reds for my skin tone but my favorite one I've tried so far is also from Orly! I love that this shade is so warm and creamy; it really is perfect for the fall! LOVE this! So on trend right now and your jumper is so cute too! Such a beautiful color especially with that cozy white sweater! Thanks for the polish tips. I haven't worn an Orly polish in so long. That is a lovely color. Such a perfect red. Gorgeous fall color. 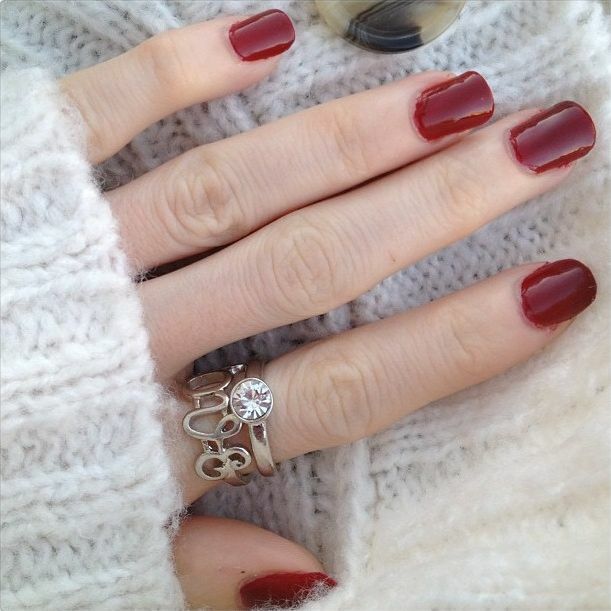 It is a deep cranberry tone that is perfect for Thanksgiving day!! Love your rings too! xoxo Hope you are having a lovely Monday. Ooh I do like this! i'm glad the second coat worked better. New nail polish always makes me nervous. I have that Orly shade and really love it. I need to re-paint my nails in a red now - definitely my favourite shade on my nails. Love the colour, so glamourous and very Marylin!! oh my gosh, i love this color! it definitely screams FALL. great color for the fall!! This is such a beautiful colour. Will surely try it out!